If you’re looking for a delicious way to use up summer blueberries, oh, do I have a recipe for you. 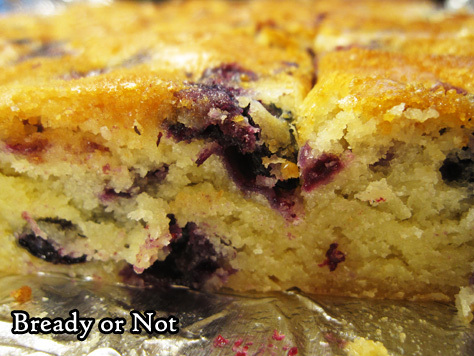 These Blueberry Hand Cake Bars are really easy to make. Seriously, there are only 6 ingredients! That said, this is a recipe for a stand mixer or hand blender will come in handy. Eggs are the leavening agent, so they need to be beaten with the sugar for an extended period of time. So if you make this by hand, consider this your arm workout for the day. The baked bars are just downright summery and fresh. Cakey, light, perfectly sweet. I could come up with more adjectives, I’m sure. 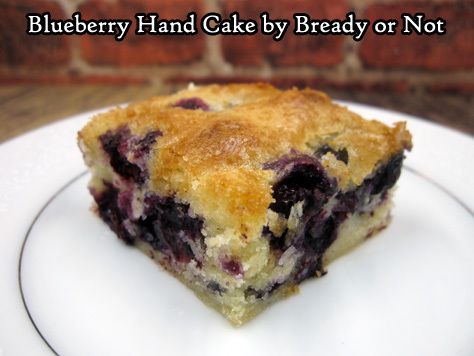 This simple recipe results in blueberry hand cake that is great for breakfast or snacks. Preheat oven to 350-degrees. Line a 13x9 pan with foil and apply nonstick spray. 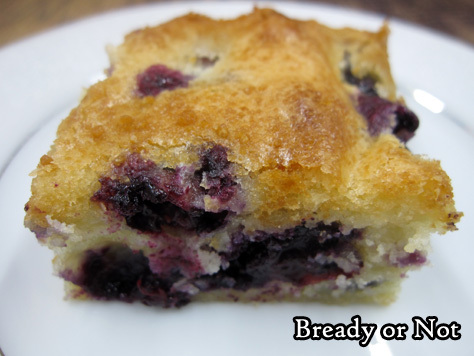 Gently rinse the blueberries, removing any stems or smashed ones, and set the clean berries in a small bowl. Using a mixer, beat the eggs and sugar for about 5 to 7 minutes, until pale in color and almost doubled in volume. The eggs are the leavening agent in this recipe, so it's important they are beaten until thickened, with the batter forming a ribbon as the beaters lift up. Add the butter and vanilla, and mix for another two minutes. 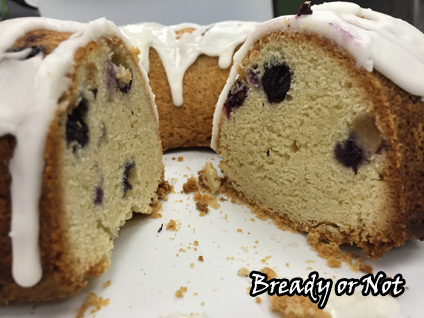 Measure out 1/2 cup of flour and carefully stir it into the blueberries to coat them, which will reduce sinking into the batter during the baking process. Slowly stir the remaining 1 1/2 cup of flour into the batter. 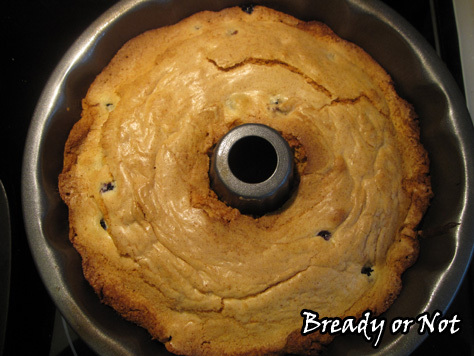 By hand, gently fold the blueberries into the batter. Pour batter into the ready pan. Bake for 40 to 50 minutes, until lightly browned and the center passes the toothpick test. Let cool completely before lifting up contents by the foil to slice into bars. Eat within two days, or freeze for later enjoyment. 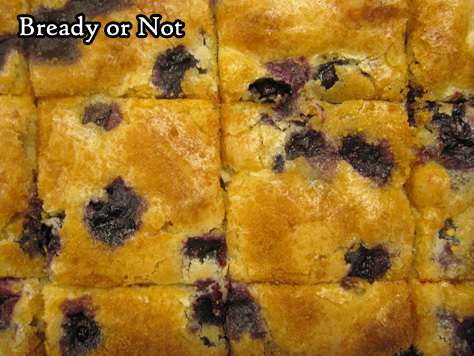 Blueberries are in season, so let’s get baking! This cake is sheer perfection. 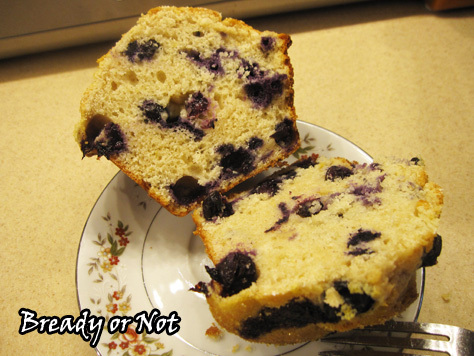 This has the tender texture of a pound cake, with added sweetness from dapples of blueberries. Oh yeah, and then there’s the glaze. 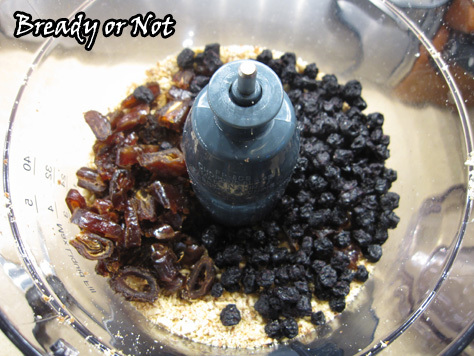 When I was meddling with the base recipe, that version felt so… naked. 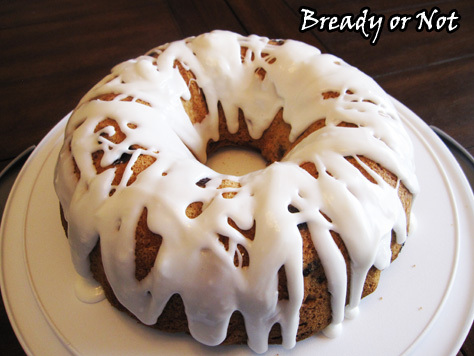 The lemon glaze adds a bit more sweetness, and a tartness that contrasts perfectly with the blueberries. The glaze looks gorgeous, too! This cake is perfect for breakfast, brunch, or dessert. Whenever the heck you want it, really. Modified from Through Her Looking Glass. You could made normal, piddly muffins. Or you can make ENORMOUS HONKIN’ MUFFINS like the kind you get in bakeries. 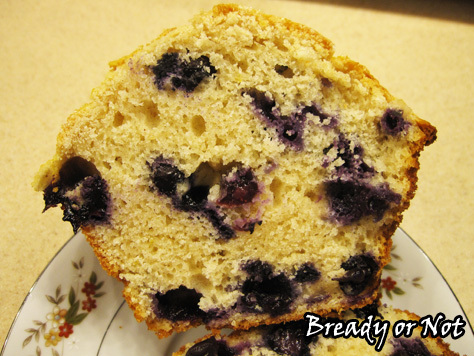 These Jumbo XXL Lemon-Blueberry Muffins taste pretty darn good and will fill your belly, too. These muffins pans are surprisingly cheap. Amazon has a couple different kinds. Search for “jumbo muffin pan” or “Texas muffin pan.” (Because everything is bigger in Texas). Confession: one reason I like these muffins is because they are pretty. I add a couple blueberries on top to make sure they don’t all sink, and I add some turbinado sugar to make them glisten. Then there’s the size. Look at the pictures here and you’ll see that silver cup for size contrast. That’s 1 cup. Yeah. If that’s too much muffin for you to eat, you can easily cut one in half. Or you can do what I do and freeze most of the batch. Wrap’em up in a few layers of plastic wrap and they’ll keep well in the freezer for a few weeks. That’s a perfect way to make these cakey lemon-blueberry bombs last a little longer! Modified from Sally’s Baking Addiction. 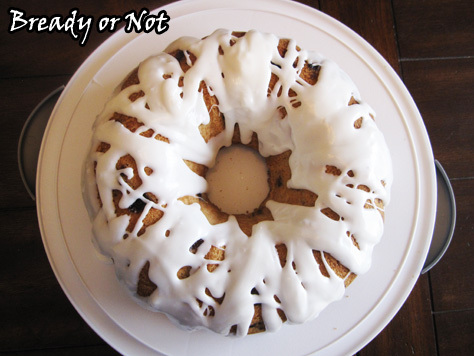 Shared another version of this recipe in 2013 on my LiveJournal. 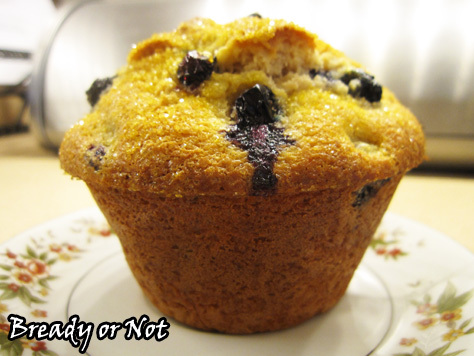 Use a jumbo muffin pan to make delicious and ginormous lemon-blueberry muffins, just like the kind you get in bakeries! These muffins are best eaten within a day or two, but they can also be frozen to enjoy later. Eat at room temperature or warmed. Preheat oven at 425-degrees. 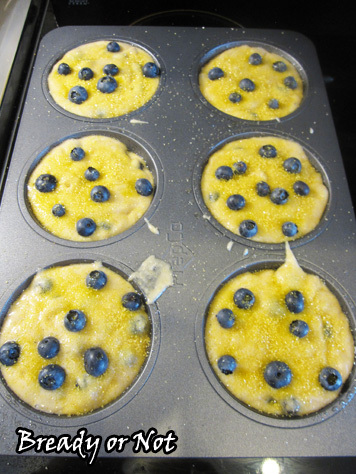 Use nonstick spray or butter on the muffin pan. In a medium bowl, mix together the flour, baking powder, salt, lemon zest, and cinnamon. Set aside. In a large bowl, whisk together the eggs and sugar. Mix in the milk, oil, lemon juice, and vanilla extract. Mixture will be pale and yellow. Gradually stir the dry ingredients into the wet ingredients, making sure to scrape the bowl, but don't overmix. The batter will be thick and somewhat lumpy. 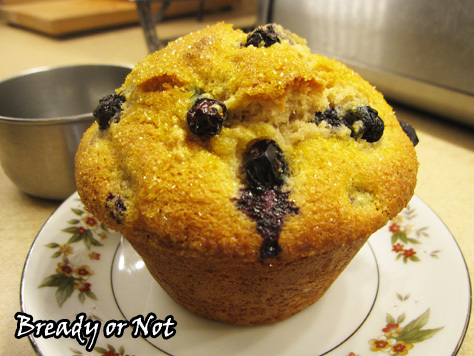 Carefully fold in the blueberries, reserving some to place on top of the muffins. Pour the batter into the greased muffin tins, filling just about to the top. Add the reserved blueberries and some turbinado or sparkling sugar, if desired. Muffins are best eaten within a day or two, but they can also be frozen for later enjoyment. Eat at room temperature or zap in the microwave to warm up. I’m happy to welcome Pat Esden to Bready or Not again. You might recall she visited last year to share a recipe for Popovers as she celebrated the release of her first book, A Hold On Me. 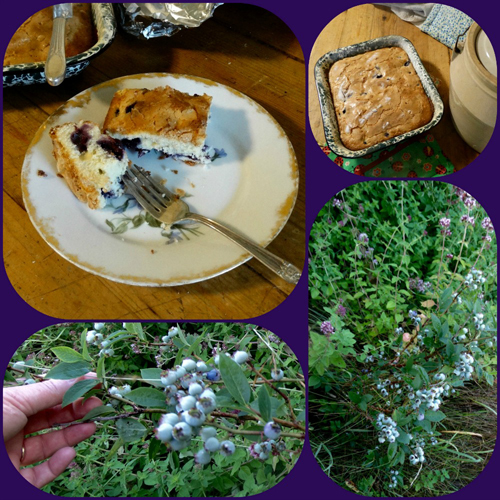 Today she shares a quintessential Maine recipe for Blueberry Cake! Her second book, Beyond Your Touch, is a new adult paranormal romance that came out August 30th. We’ll start things off with an interview to learn about her Dark Heart series. You sent a lovely blueberry recipe. YUM. Can you explain how this ties into your books’ world? Both A HOLD ON ME (Dark Heart book #1) and BEYOND YOUR TOUCH (Dark Heart book #2) are for the most part set on the Maine seacoast, a prime area for both commercial and wild blueberries. 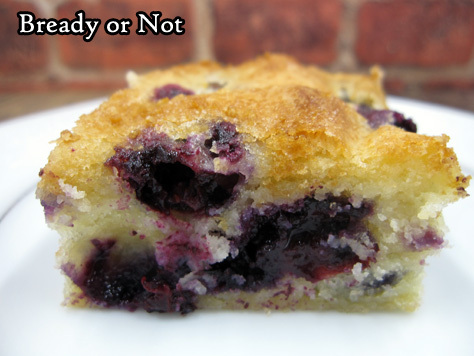 The main character, Annie Freemont, and her family often have blueberry muffins for breakfast. The cake recipe I’m going to share is something they’d have at teatime for sure. Also Annie’s love interest, Chase, is a blueberry fanatic. He was born in Maine, but was kidnapped as a child and raised in the djinn realm until he escaped in his late teens. During his years of captivity, Chase often went hungry. As a result, having edible berries growing right outside his cottage is not only a tasty treat for him, it’s also emotionally comforting. In reality, he’s a bit of a blueberry glutton. You do a great job of capturing the new adult voices in A Hold on Me and Beyond Your Touch. Do you have advice for other writers who are working on voice in new adult fiction? New adult is a category of fiction where the main character and point of view are a person or persons between the age of nineteen and twenty-six. It’s not a novel written through the eyes and sensibilities of someone looking back on that stage of their life. It’s that sensibility that is most vital to remember when you’re writing new adult. The motivations and choices of people in that age range will vary, but they are not the same as a younger teenager who has less life experience in general or an older person who has more experience. It’s important for a writer to put themselves in the mindset of being that age and to look at each choice and reaction the character(s) make to be sure they are appropriate for a new adult. What has been your greatest challenge in working on your Dark Heart series? The Dark Heart series consists of three novels. The biggest challenge for me has been swapping between books during the various editing and marketing stages. For example: in the middle of drafting book 3, I received notes from my editor on book 2. I had to put book 3 aside for a month to do edits on book 2. Once book 2 was turned in, I went back to book 3. But I had to swap again and focus on book 1 when it was released. LOL. It’s crazy making! Thank you as well. I love visiting. Beat 2 egg whites until stiff, and set aside. Cream together shortening, vanilla, sugar, and two egg yolks. Sift flour and baking powder together. Add to cream mixture alternating with milk. Fold in egg whites and blue berries. Pour into 9” pan (greased and floured) and sprinkle top lightly with sugar. 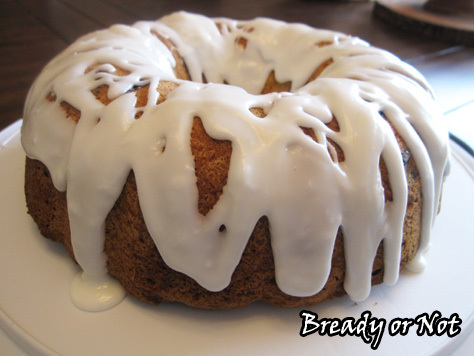 This is a traditional New England dense desert or breakfast cake. 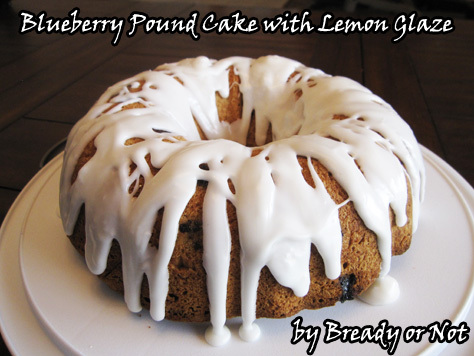 Just a touch lighter than pound cake. No frosting needed. Annie Freemont knows this isn’t the right time to get involved with a man like Chase. After years of distrust, she’s finally drawing close to her estranged family, and he’s an employee on their estate in Maine. Though she never intended to stay on the estate for long, her father’s illness and the mysteries surrounding her family made leaving impossible. And now with the newfound hope of rescuing her long-missing mother, Annie’s determined to be involved with the family’s plans one way or another. Her new adult paranormal novels, A HOLD ON ME (book #1 in the Dark Heart series) and BEYOND YOUR TOUCH (book #2 Dark Heart series) are available from Kensington book. REACH FOR YOU (book #3 Dark Heart series) will be released in 2017. Gluten-free. Basic, wholesome, raw ingredients. No added sugar. No baking involved. Tastes like a mini blueberry muffin. Oh yeah. 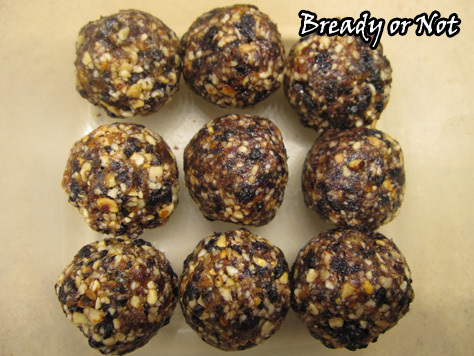 I have posted about breakfast energy truffles before. 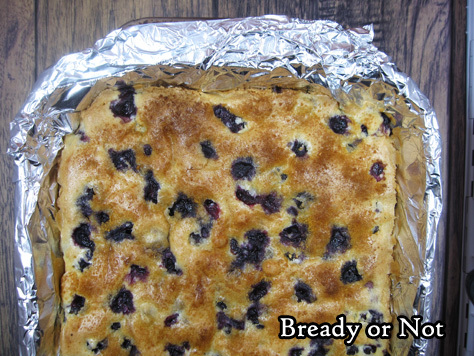 This is a distinct variation because of the use of dried blueberries. Mind you, those can be an expensive ingredient, but you only need 1/2 cup for the recipe. 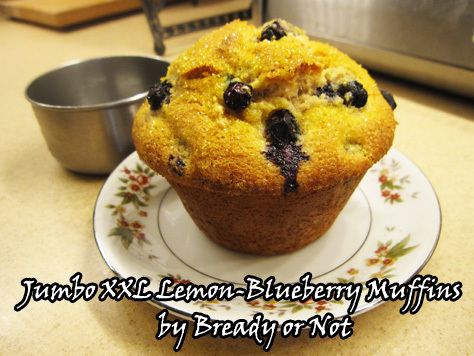 I thought the blueberry flavor might be overwhelming, but the addition of a little lemon juice does a lot to mellow it. These are super-easy to make in a food processor or high-powered blender (though for the latter, you might need to blend this in smaller batches). It just takes a few minutes to make these truffles. Store them in the fridge for upward of a week or two. They are perfect for a breakfast or snack! 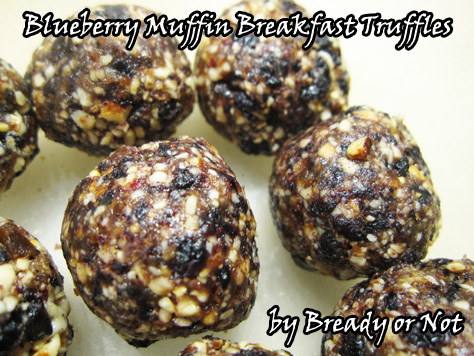 Modified from Blueberry Muffin Energy Balls at The Healthy Maven. 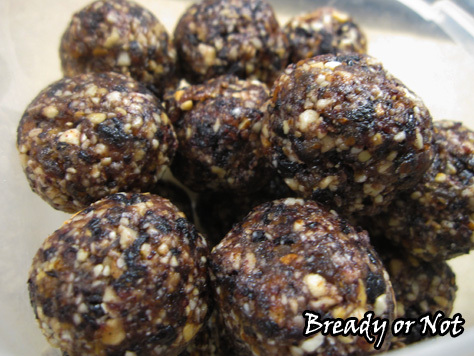 These healthy no-bake energy truffles use raw ingredients to make a delicious breakfast or snack! 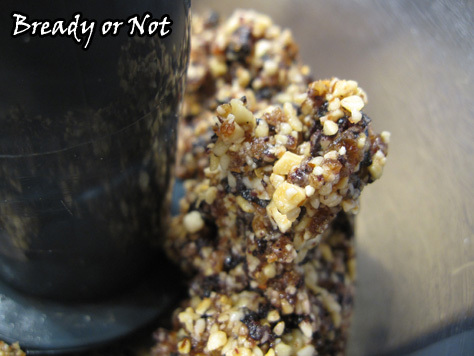 Use any combination of nuts you want to equal one cup. This recipe makes 19 teaspoon-sized truffles. Add the lemon juice, vanilla extract, and salt. Blend everything until it forms a big sticky ball. Use a teaspoon or tablespoon scoop to form balls. You might need to stir the mix as you go, as the lemon juice tends to lurk at the bottom. Use your hands to compress each ball. Store in a sealed container in the fridge for up to two weeks, or freeze between layers of wax paper.